Improving competitiveness in crops so weeds don’t matter. Factors that improved flax stand establishment increased competitiveness with weeds. Photo by Bruce Barker. Can flax help manage herbicide-resistant weeds and be an alternative cropping choice? Moria Kurtenbach, a research assistant in the department of plant sciences at the University of Saskatchewan thinks so. She researched weed control in flax as part of her master of science postgraduate degree over three years from 2014 through 2016 with Dr. Christian Willenborg and his team. “Flax is a relatively low-maintenance crop without a lot of insect or disease problems. The one drawback is that it is a poor competitor with weeds and there are a limited number of herbicides registered for safe, in-crop use,” Kurtenbach says. As part of Kurtenbach’s research to find new weed control options for flax, she screened existing chemistries not registered on flax for crop safety and impacts on yield, and compared them to three industry standards and an untreated check. The herbicide screening trials were conducted in 2015 and 2016 at two sites near Saskatoon, one at Indian Head, Sask., and one at Carman, Man., for a total of seven site years. The unregistered flax herbicides included fluthiacet-methyl (Group 14), fluthiacet-methyl plus MCPA, pyroxasulfone (Group 15), pyroxasulfone plus sulfentrazone (Group 14), flumioxazin (Group 14), topramazone (Group 27), and topramazone plus bromoxynil (Group 6). The herbicides were applied pre-plant and post-emergent depending on the herbicide, and at one and two times the label rates. Industry standards were bromoxynil plus MCPA, MCPA (Group 4), and sulfentrazone, all applied according to label directions. Crop injury was assessed at seven, 21 and 56 days after treatment. Ten per cent crop damage was considered acceptable, 10 to 30 per cent as unacceptable and more than 30 per cent as severe. Kurtenbach says that crop injury varied by location and year, depending on environmental conditions. Flumioxazin was the least promising because of severe crop injury that resulted in lower yield compared to the untreated control treatment. The most promising herbicides with acceptable crop tolerance were fluthiacet-methyl (post-emergent) and topramezone (post-emergent) applied alone, and when pyroxasulfone (pre-emergent) was applied alone or in combination with sulfentrazone (pre-emergent). “There were some chemistries that yielded better than the industry standards. Pyroxasulfone plus sulfentrazone at the 1x rate yielded the highest,” Kurtenbach says. A major part of integrated weed control is diversity in crop production practices that help to make crops more competitive with weeds. Seeding rates, seeding dates, variety selection, row spacing, and herbicide choices influence how competitive a crop is with weeds. Kurtenbach investigated some of these integrated weed management practices in flax. 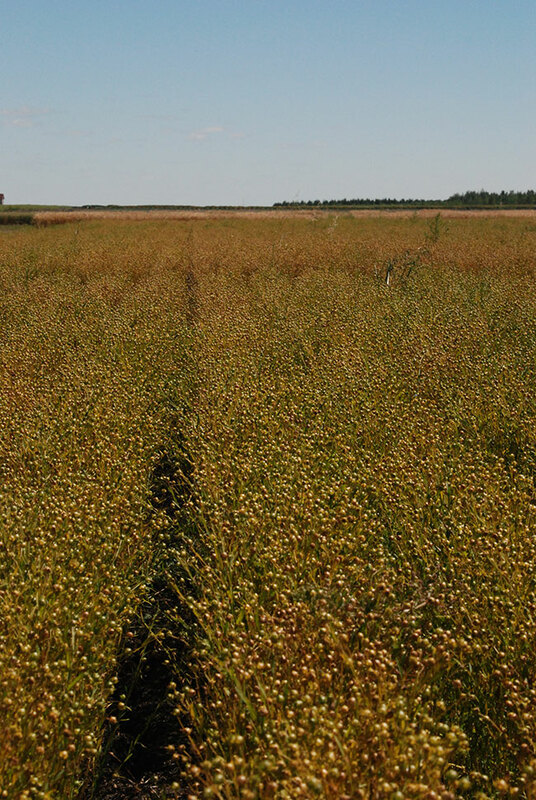 To investigate integrated weed management practices in flax, Kurtenbach conducted field experiments at several locations across the Prairies from 2014 through 2016 at Ellerslie, Alta., two sites near Saskatoon, and Carman and Morden, Man. for a total of 11 site years. Short (Prairie Grande) and tall (CDC Sorrel) flax varieties were seeded at 400 or 800 seeds per square metre in early or late May. An in-crop herbicide at the recommended rate was also compared to a no-herbicide treatment. Crop establishment, crop height, weed biomass, yield, and thousand kernel weight were measured. When seeding rate was increased or when the tall variety was grown with an herbicide application, weed biomass decreased significantly. When an herbicide was used, differences in seeding rate and seeding date didn’t impact yield. However, combining all best practices did produce the highest yield. The tall variety seeded in early May at 800 seeds per square metre with an herbicide application yielded 1,407 kilograms per hectare (kg/ha). Conversely, growing a short variety seeded in late May at 400 seeds per square metre without an herbicide yielded 640 kg/ha. Combining all best practices resulted in 2.20 times greater (or 220 per cent higher) yield. To further test the benefits of stacking multiple production practices to improve weed competitiveness and increase yield, Kurtenbach is involved in two additional research studies being conducted by Willenborg’s lab. The first looking at the effect of row spacing, seeding rate, nitrogen fertilization and fungicide application on flax yield. This three-year trial ended in 2018. Based on preliminary results from the first two years with five site years, the narrow row, high seeding rate, high fertility and fungicide application produced the highest yield. This highest yielding combination increased yield by eight bushels per acre across all sites. A second research trial started in 2017 is looking at 17 different cropping systems with diverse crop rotations, two seeding rates and a comparison of no herbicide with an herbicide application. The results won’t be available until after the 2019 growing season. Kurtenbach says that a farmer doesn’t have to grow flax to be able to implement integrated weed management (IWM) practices. IWM has been widely researched in other crops with benefits of increased weed competition and weed management.